Escape Miami teamed up with 30 of Miami’s top fashion bloggers to present the first-ever Swim Week street style photo installation called "Summer Crush" which will be on display @ the Sagamore Hotel on Saturday, July 20th. I was fortunate enough to be able to be a part of such a creative project and hope that my readers can attend such a wonderful event. Here are two of my three photos for the shoot, the third one will be displayed at the event. The event is complimentary to attend. 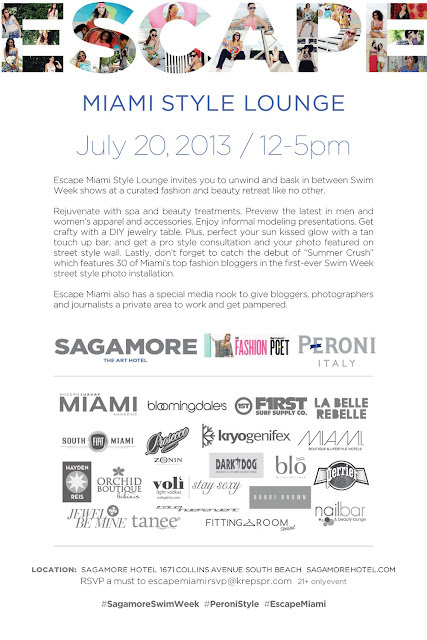 RSVP a must to EscapeMiamiRSVP@krepspr.com. Must be 21 or over to attend. Discounted $15 valet parking is available. aw, you look super cute! def going to check out the event!